Final Cut users can now see more color options in the Role Editor, change the width of the Inspector when adjusting effect parameters, and run Canon Log 3 and Sony S-Log3/S-Gamut3 log processing, Apple said in release notes. DVD creation is another focus area, for instance offering improved font quality in menus and chapters, as well as better overall image quality. The update also makes bug fixes, solving glitches with older libraries, Reveal in Browser, and the viewer disappearing when leaving fullscreen mode. Audio waveforms should redraw faster when using clips being imported while recorded to disk. The iMovie update is purely a maintenance release, dealing with problems such as red tint being added to camcorder imports, and iPhone videos not appearing in the import window. Final Cut is $299.99 new. iMovie comes bundled with modern Macs, but is otherwise $14.99. For existing users, Thursday's updates are free downloads via the Mac App Store. Apple has flat-out given up on their software on the Macintosh platform. It used to be the iWorks and iLife packages were a "must have", now it's just given away as an afterthought... It's so frustrating. Huh? You're responding to an article about updates, so your statement is flat-out incorrect. Also there have been several updates to iworks lately, and i wouldn't want to be without it. No desire to pay for Office, and no need to do column-flows or whatever it is people complain about Pages not having. You read the article right? Apple charges for Final Cut Pro. Like always iMovie is free with a new Mac purchase. I've seen folk who haven't bothered to read the article, but this the first time I've come across someone who didn't make it to the end of the title. I wonder if the same good souls who confessed that the 2013 Mac Pro was a fail for high end users, could be induced to apply the same thought to FCP X. I can't use a product where I can't lock tracks or timeline content to stop it sliding like jello. And I still can't send a presentable embedded AAF to a ProTools session that is anything like what a sound mixer might recognise. Sorry to harp on about this for 5 years, but yesterday I had to get content from DaVinci to Motion for a VFX job (am I the only person still using it for motion tracking fixes?) and the path was an XML to FCP7, "Send to Motion..." via Motion 4, then open that project in Motion 5 - won't even look at a raw XML, and even if I'd started in FCP X (which I wouldn't have, because this is on the back of a grade) I couldn't have done this because there's no way to Motion from FCP X. Both Motion and FCP are now start-to-finish tools - minus decent audio mixing. Little wonder our facility does more business from Avid, Adobe and FCP 7 sources than FCP X. Having said that, getting a project into Resolve is a very well developed path - if anyone used FCP X for projects they didn't completely finish in some fashion on their laptop. These are minimal updates for people who really need to get complex projects done. iWork, Pages in specific, was much better prior to the 2013 back-port from iOS. I also use the older version of Pages for that reason. Pages was more a kind of DTP package, with the emphasis on objects rather than Word that integrates images into the tax by default. I thought it was a canny niche to fill. Since then, it just looks like a very basic and less capable version of word. I am not saying you have made this mistake but tons of Pages users I have helped missed the change Apple made a while back when selecting DTP or WP was up front. Many think the DTP interface has gone. 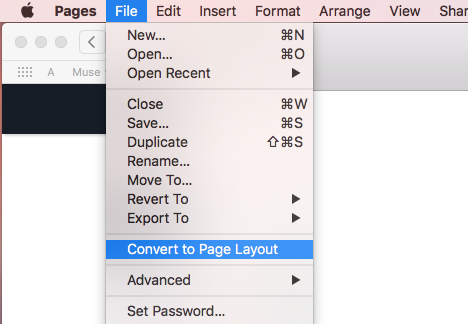 However, for some reason, now you have to create an new document which is by default at a WP document and then 'convert it' to a page layout. Or as I have, save that converted DTP page as a template to save time. Super useful. Thanks for sharing! Its true i had actually thought that the DTP interface was gone. Yeah: that REALLY made my week, too. Missed that completely, and have already put it to good use.